When you have three kids or regularly have three kids staying at your home for sleepovers, you might want to think about triple bunk beds. Traditional bunk beds include two sleeping surfaces, but if you have tall ceilings triple bunk beds have a third on top that would be amazing for extra guests. We’ve put together this buying guide to help you choose a triple bunk bed that’s perfect for your home. Let’s get started! Material: Most of the bunk beds on this list are made of either wood or metal, both of which are really sturdy materials. This might come down to aesthetic more than any other consideration because both are great. Access: This refers to how you get into the different bunks. For the most part, these will be ladders that are either built-in or bolted to the bunks so that your child has a secure way to get up. Size: Is it a full-sized bunk bed or a twin? Most bunk beds, whether they’re double or triple, are going to be twin-sized, but some also come in full, which is useful for slightly older children. Finish: The finish tells you what color that the beds are going to be, including a ginger, natural wood, black, espresso, and mocha. There are so many different shades these beds can come in, for any décor! Dimensions: The dimensions will tell you how large the beds are, and also how high. This can help you position them properly in your home and especially where the top bunk is going and if your ceilings are too low. Warranty: The warranty will ensure that your purchase is backed up if it arrives damaged or defective. It’s like insurance for your product, and if it breaks due to normal use within that time frame, you can get a replacement. 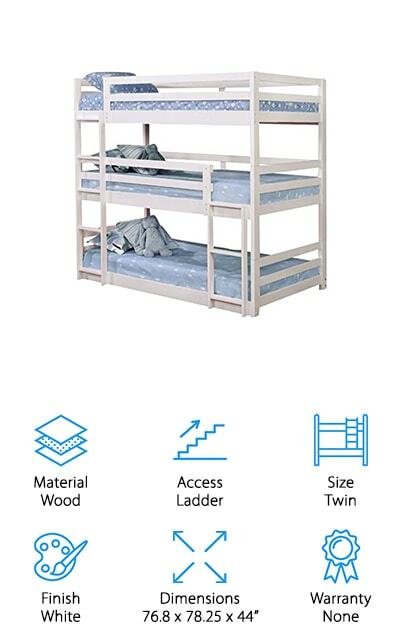 Now we can get to our triple bunk bed reviews. We’ve done all of our research in order to present you with the best selection of triple bunk beds available. We want you to make the decision that’s going to be best for you and your family! Our top pick and budget pick are the best options we found, and you should take a look at them before moving on to the rest of our list! Our choice for the best triple bunk bed is this rustic one from Chelsea Home. There are three twin-sized beds stacked atop each other in this towering sleeping arrangement, so your kids can fit comfortably in less space than they normally would be able to. The ginger stain finish makes these attractive beds look all the more so, adding to their rustic charm. They’re super sturdy, as they are made of solid pine, and they are held together with metal brackets that help to keep everything together and functioning correctly. This even includes the slat packs so that you can attach the stabilizing timbers across the ends of the bed. It can support a total of 400 pounds overall, so three small children will be no problem for this wonderful bed! The wooden ladder is comfortable and easy for your kids to use, so they can get in and out of their beds without a problem. This mocha-stained set is a sturdy bunk bed that will be perfect for your three children or even some of their friends when they come to visit. What’s cool about this piece is that you can change the configuration so easily. You can use it as three separate twin beds if your children prefer that, or else a daybed and a bunk bed if that works in their room. We love how fluid and versatile this bed set is, and that it will change with your children’s preferences! It’s also a cheap bunk bed and won’t put too big a strain on your pocketbook. It’s perfect for sleeping multiple children when you don’t really have the room to spread out three separate beds, and the additional sleeping space is really useful. The ladders are built into the sides of the bunks, so it’s safe to get up and down from even the tallest part of the bed. This beautiful triple-decker bunk bed is a great space saver that is also an incredible investment. 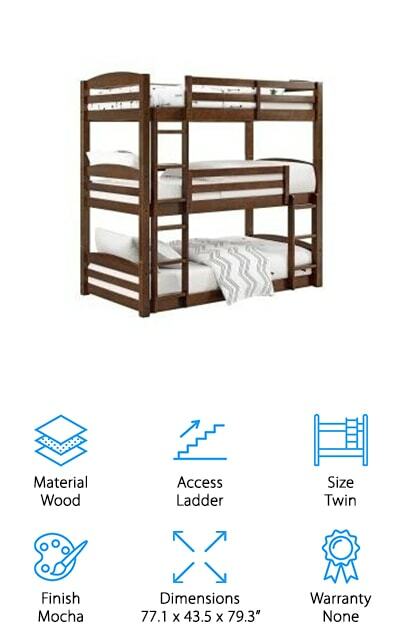 These triple bunk beds have the unique ability to be made into three completely separate beds, or a bunk bed and another twin bed. It will suit your family for many years to come, no matter how they want their beds to be split - you can even put the beds in their own rooms. There’s a 400-pound weight limit on each of the beds. It also comes with slats as well, so that the mattresses can be supportive. We love the fluidity of these beds and the way you can make them whatever you want to be. The cappuccino finish is beautiful and gives any decor a nice classic feel. These beds are nice and sturdy both on their own and as a triple stack, and we’re sure your kids are going to love it as much as you do. 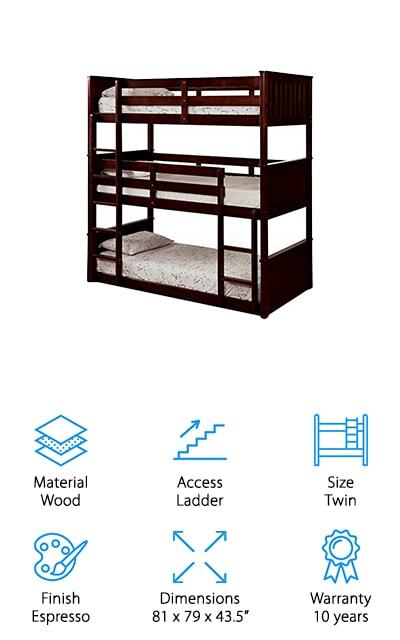 This triple bunk bed with storage is unique on our list because it can sleep up to four children instead of just three. This is due to the trundle bed that’s stored under the bottom bunk. All four of the available beds take standard twin mattresses and can support up to 400 pounds so it’s perfect for small children. The steel frame is a little sturdier than wooden ones, and instead of being free-standing it’s got a wall mount bracket to keep it upright and safe for your kiddos. There are guard rails on the top two levels that are made out of wood so that the ones on the top bunks won’t be able to climb out of them or fall out of them. It’s a great triple bunk bed for foster families because of the increased available sleeping space! If it’s important that your kids have their own sleeping arrangements, this is the perfect bed for you. 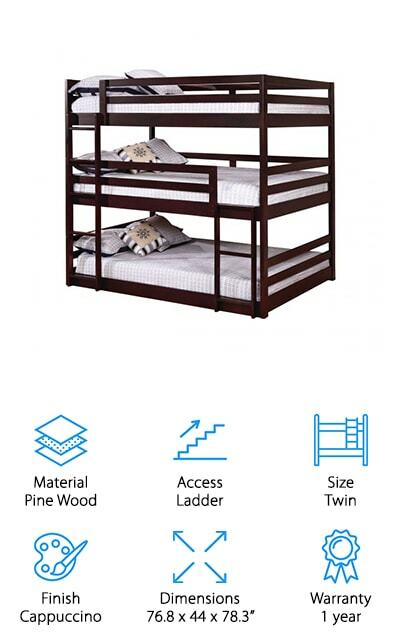 This Bowery Hill triple bunk bed is one of our favorites because of how beautiful it looks. The finish is a beautiful espresso over solid wood. The transitional style of this piece allows for each bunk to have their own headboard and footboard, rather than being open like some others on our list. 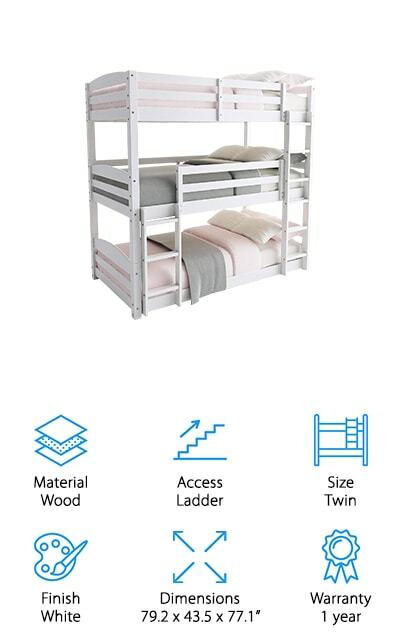 It comes with a slat hit for the bunks so that you can get the mattress set up securely, and there are two attached ladders that will allow your kids to get to both of the bunks without having to wait on the ladder, which might cut down on a lot of bedtime stress. The top and middle bunk have guard rails that will help make sure that your kids won’t fall out of them in the middle of the night, which is great for smaller kids. It’s a sturdy sleeping solution for either your home or apartment. We love it and you will too! This Coaster Home bunk is one of the top triple bunk beds that we found, mostly because it’s different than most of the other bed son our list in style and design. It’s made of metal for one thing, which is a nice touch. It’s finished in bronze and has several rails on the middle and top bunk to keep your children contained and happy while they’re sleeping. There are little stylish plaques on the rails of the beds that add another dimension of style to these beds. The bronze finish is classic and will go well with a bunch of different décor options. We love that this bed looks and feels sturdy and substantial. This triple bunk bed definitely won’t let you down when it comes to the sleeping space and sturdiness that you’re looking for. Plus, we love that instead of being a twin triple bed it’s a full-sized so that each child has a huge sleeping space! This transitional piece is one of the best bunk beds on our list. It’s a beautiful piece, and we love that the headboards and footboards are treated differently than the rails on the sides of the bed. This gives each separate bunk their own unique feel and helps each of your children to feel like they have their own private space even within the realm of bunk beds. Each bunk also has slats so that you don’t have to try and fit box springs onto the frames with the mattress. This increases the space available to each child while they’re playing and sleeping. The top and middle bunk, of course, have guardrails that help your children feel more secure while they’re sleeping. The entire unit is also made of solid wood, so it’s sturdy and stands really well on its own. For space saving solutions, it doesn’t get much better than this triple bunk bed! 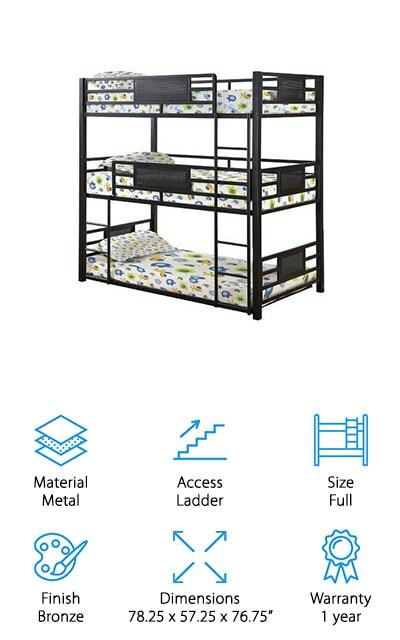 This triple bunk bed by Pemberly Row has a nice open-rail design that will make each child a little bit more comfortable and less like they’re sleeping in a box. For some children, the closed-in design is anxiety-inducing, so this open design is really beautiful and well-conceived. It also has a white finish that matches a wider variety of room designs, including being great for use in little girls’ rooms because it will fit with all of the lighter design elements. But it will fit with a wide variety of color schemes and designs as well! This bunk bed is easy to get into and sturdy enough that you won’t feel like your children are in danger, even on the very top bunk. We love that! 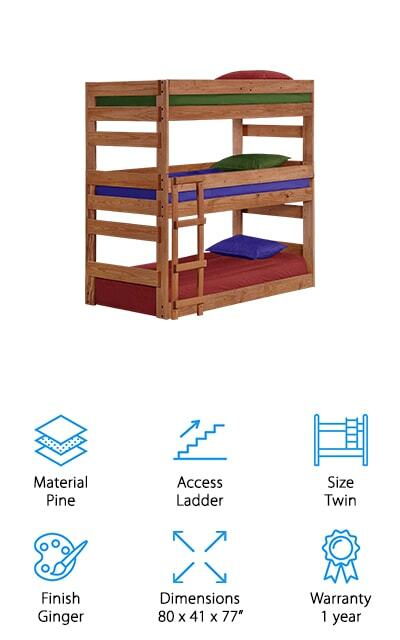 They are standard twin beds, and this entire unit is a great triple bunk bed for kids! It will be able to stand up to all of their play and climbing on it. 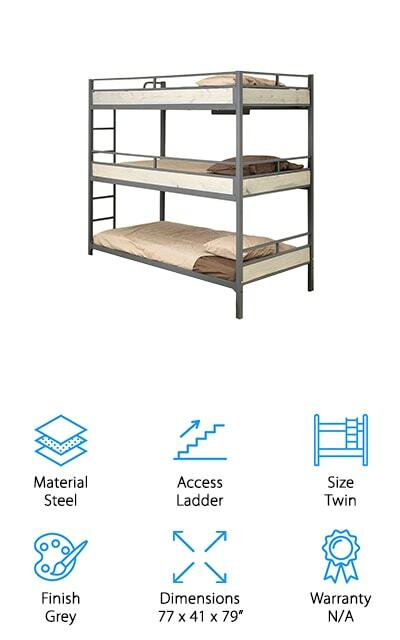 These twin triple bunk beds are sold by Svitlife. The Nora unit comes in a beautiful mocha finish with multiple configurations. It comes with a kit so that you can separate the beds into three separate beds, or a bunk bed set and a daybed. Basically, you get three separate bed frames for the price and you’re able to configure them however you’d like to. They include the bed slats so that you don’t have to use the box springs when you get to that point. Each bed can hold up to 160 pounds no matter how they are set up. We love the idea that they can be separated however you’d like, which adds a lot of different options for you. This bed will be able to last your kids a long time with all of your different options. This white triple bunk bed would be perfect for a room with two or three little girls! It’s a classic design that looks great paired with bedding of just about any color or design. There are three bunks, each of which is supportive and sturdy enough for small children. If you happen to have three kids of a similar age, this might be the perfect addition to save some room in your home. If they have to share a room, why not get a bed that’s going to give them more room to play? They’re going to love this bed set! All you need in addition to the set is different twin mattresses for each bunk. The slats will help support the mattresses and keep your children safe when they’re climbing up and down on the wooden ladders that lead to the second and third bunks. If you’ve got several people to sleep in much smaller spaces, this is perfect!